Small Screen Horror OR "I Saw It On The Television." these are movie musings for snarky movie nerds. there's always spoilers. What's the deal with this stupid blog, anyway? I thought I'd try another experiment and write a bit about horror anthology TV shows. If this post proves popular, perhaps I'll tackle horror cartoons or horror series shows in the future. Just to put it out there, this post doesn't claim to be a list of the "best" or the "scariest" TV horror offerings; think of it as a door opener into the (often times) enjoyable world of horror on TV. Although Hitchcock only directed a handful of episodes himself, he introduced each episode in his wonderfully droll manner and his style could be felt throughout the series. This show isn't strictly "horror" as most of us think of it now - the stories are more like, "thrillers." No graphic killings, no supernatural creatures, just people doing terrible things to one another. If you love his movies, you'll likely enjoy the show. Early episodes are approximately 25 minutes long. "Lamb to the Slaughter" - a woman kills her husband and the police struggle to find the murder weapon. The Twilight Zone is the brainchild of Rod Serling: author, activist, and producer (among other things.) These stories were a mix of scifi, horror, and fantasy. Serling wanted an outlet for his social and political commentary - enter TV. Early episodes were approximately 25 minutes long. "The Monsters are Due on Maple Street" - chaos in a small town neighborhood makes the residents turn on one another as paranoia steadily grows. This is possibly one of the most famous Twilight Zone episodes. The Outer Limits is a poor man's version of The Twilight Zone. WIth stories that focused mostly on scifi but without the guiding hand of Rod Serling, the show lacked the impact of The Twilight Zone. Interestingly, there were a number of great scifi writers who contributed to the show but, it still never managed to reach the popularity of The Twilight Zone. Each episode is approximately 50 minutes long. "Demon with a Glass Hand" - written by one of scifi's greatest contributors (Harlan Ellison) the episode deals with a man with no memory who isn't what he seems. Night Gallery saw the return of Rod Serling. Although he often contributed to the shows writing, he did not have exclusive control of the shows content. Regardless, Night Gallery had well-written, engaging stories. These stories were mostly "tales of the macabre", sometimes featuring human killers, sometimes supernatural creatures, and often times featuring retellings of H.P. Lovecraft's work. Early episodes were approximately 45 minutes long. "Silent Snow, Secret Snow" - adapted from the Conrad Aiken short story (and narrated by Orson Welles), Silent Snow, Secret Snow is the story of a boy who would rather day dream than face reality. Produced by horror great George Romero, Tales From the Darkside emerged after the success of Creepshow but the failure to turn it into a TV series. Tales from the Darkside featured horror stories more in line with what we think of today. They were also somewhat campy - which wasn't unusual for 80's horror. Each episode ended with some sort of twist: often the person you thought was the hero was really the killer, etc. Episodes were approximately 30 minutes long. "Answer Me" - a woman is tormented by the incessant ringing of a phone. More of a "mystery" and "thriller" series than a horror series, The Hitchhiker was co-produced for the US and Canada. The Hitchhiker is also, notably, HBO's first dramatic series. Most stories featured characters wresting with their inner demons and although the stories themselves may have been fairly cheesy, without the immense success of this show we wouldn't have any of the other great HBO series over the past two decades. "WGOD" - Gary Busey is a crazed radio evangelist that gets what's coming to him. Sad to say, I cannot find this video online anywhere. If you happen to come across someone, somewhere, watching this crazy show - track down this episode and enjoy! More scifi and fantasy based, many of these stories were either re-tellings or adaptations by Ray Bradbury of his own novels and short stories. This show was also produced by HBO. Because of the source material, this show was exceptionally well-written and still holds up now. Episodes were approximately 28 minutes long. "The Long Rain" - astronauts crash on a planet where the rain never stops. Originally one of Bradbury's short stories, I read it when I was 10 or so and it still haunts me to this day. Created as a spinoff of the Nightmare on Elm Street movies, Freddy's Nightmares was originally intended to be a series show. The producers changed their minds on this when they realized how short lived that series would be (Freddy will kill off all the main characters and then what would be left?!). Instead, the show featured horror stories that took place on Elm Street (as in the movies) with Freddy overtly playing the villain or sometimes only playing the implied villain. Episodes were approximately 48 minutes long. I can't lie to you guys here, this show is barely worth watching UNLESS you're a diehard Freddy fan. There may be a place to find episodes online but it's unlikely. Unlike many of the other shows on this list, Monsters was strictly rooted in horror with each episode featuring some sort of monster. This series also differed as there was no "host" who introduced each show - instead, they had an adorable opening sequence with a family of monsters gathered around their TV. Much like Tales from the Darkside, the stories were somewhat campy and featured some element of humor to help lighten the viewer's mood. Episodes were approximately 22 minutes long. "The Mandrake Root" - while cleaning out her grandmother's basement, a girl discovers a bizarre plant and her grandmother's deepest secret. You can find this episode on Youtube in two parts. Probably the most popular show on this list, next to The Twilight Zone. Produced for HBO, based on the immensely popular EC Comics of the same name, and boasting cameo appearances by nearly every up and coming star in Hollywood, Tales From The Crypt was mostly horror focused. 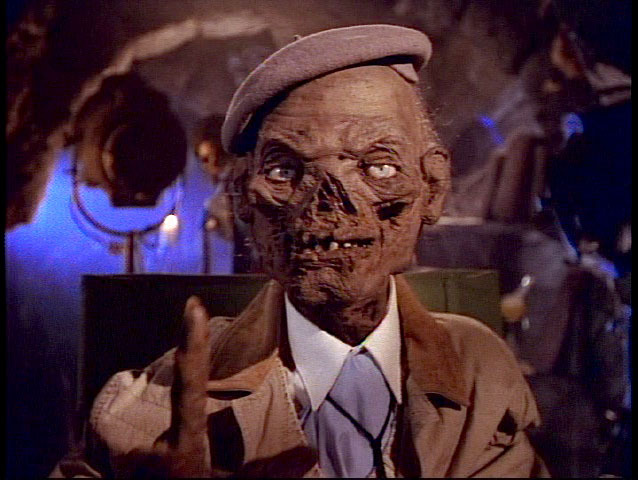 While many of the stories stick with us, the show is probably best known for it's host, The Crypt Keeper, who was a sassy skeleton. Many episodes used a healthy dose of humor to "balance" the horror. Episodes were approximately 25 minutes long. "Confession" - a serial killer is terrorizing the city, could it be the horror writer? Masters of Horror was produced for Showtime and signaled the revival of horror on TV. While every other show on this list has, at one time or another, been graced by a famous horror director or author, Masters of Horror was conceived strictly as a vehicle for the world's best horror directors. Each episode is a mini-movie brought you by your favorite names in the horror industry. The first season was incredibly strong but, season two lacked the quality of the first. Episodes were approximately an hour long. "Dance of the Dead" - directed by Tobe Hooper. In a post-apocalyptic world, one seeks entertainment where one can get it. Sometimes, dead isn't dead. Dig in, Kiddies! And let me know what you love best. When I'm not watching movies, I'm reading about movies. I stumble across all kinds of articles, blog posts, book excerpts, etc. in my quest to absorb as much movie knowledge as possible. Now, I'm snotty and loud-mouthed and opinionated but I'd never begrudge another human their opinion. Seriously. You're absolutely welcome to have any opinion about any thing you want. However, I must warn you, if I think your opinion is stupid, I'm absolutely going to say so. I've recently stumbled on an article completely brimming with so many idiotic opinions that I'm actually compelled to craft a response. Here's the gist of the original article: there are some horror movies out there that are so disturbing, you'll only ever want to watch them once. I've have taken her original list and refuted her claims without pulling her entire article over. You can read the original article here. Body horror; something that effects each one of us as we are made of squishy, fallible, and finite flesh. Tackled many times in many ways throughout the years, body horror will stick with us until we finally learn to lose these weak, human bodies and begin existing in some other form. There are many lenses through which to view body horror, lets talk about a few quickly before talking about some specific films in this genre. I learned a really interesting lesson the other night: no matter how many times you've seen a movie on a small screen, you haven't really seen it until you've done so on the big screen. Thus begins my story of realization in which I discover Pet Sematary (seemingly for the first time) and develop a theory that it might actually have been directed by David Lynch (this last bit being hyperbole, of course–but I've got a strong case for it, so stick with me). Over the years, I've watched Pet Sematary a handful of times and while I know all the major plot points (and always remembered Denise Crosby as being completely awful), I definitely feel like I've seen a completely different movie this time around.